App-based taxi booking service Uber is facing legal action over claims it is failing to provide basic rights to its drivers. The GMB union will challenge the company's claim that its workers are partners rather than employees. The union says Uber is breaching its duty on pay, holidays and health and safety. The firm says making drivers employees would mean losing the flexibility that makes the job appealing. GMB, the union that represents professional drivers, has instructed the law firm Leigh Day to take action on behalf of its members driving for Uber. Nigel Mackay from the firm believes legal action could result in "substantial payouts" for drivers. "We believe that it's clear from the way Uber operates that it owes the same responsibilities towards its drivers as any other employer does to its workers," he said. "In particular, its drivers should not be denied the right to minimum wage and paid leave." 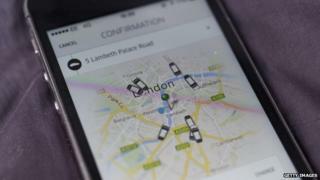 The GMB's Steve Garelick said: "Operators like Uber must understand that they have an ethical and social policy that matches society's expectations of fair and honest treatment." Uber describes itself as a "fully licensed" service that connects those needing a ride with a background-checked private driver, and takes a cut - typically 20% - of the fee. In May, Transport for London reported the number of private hire vehicle licences had risen from 52,000 to 77,000 over the previous 12 months, and most of that increase was down to new Uber drivers. An Uber spokesman said: "One of the main reasons drivers use Uber is because they love being their own boss. "As employees, drivers would drive set shifts, earn a fixed hourly wage, and lose the ability to drive elsewhere as well as the personal flexibility they most value." Is Uber already harming the traditional taxi?